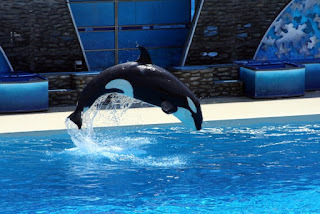 Today was Sea World Day! We started out the day eating a nice breakfast in the hotel, then heading out to Sea World. The temp was around 75 degrees, but a little humid. We arrived around 10:15 am to find extremely long lines of cars! It was $18 for Preferred Parking, but it's worth it because we were right by the entrance gate. 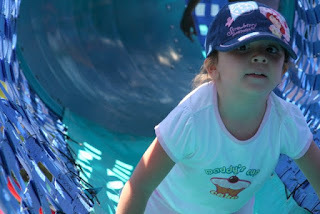 First, we went to the Dolphin Cove to try to feed the dolphins, but there were way too many people and, we didn't get over to buy some fish to feed them. 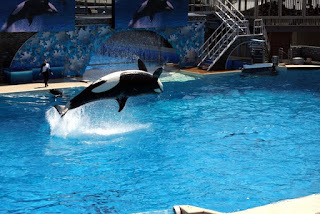 Then we headed over to Shamu Stadium to see "Believe", which is the same show in San Antonio. It was a little different, and the stadium here in San Diego is not covered, so we were sitting in the sun the whole time. I guess in San Antonio they have to have the covers over the stadium because it gets Africa hot in Texas! The sun was a little hot, but at least it wasn't 107 degrees and 90% humidity! We walked over to the Forbidden Reef to see the Sting Rays, which was really cool because we got to touch them. Fortunately, for us, we left the exhibit without any barbs stuck in our chests. 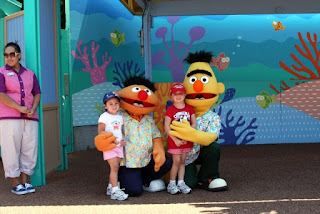 The best part for the girls was going to the little Sesame Street area they have. It's all Sesame Street themed rides for the little ones, along with character photo ops with Elmo, Big Bird and a few other characters. 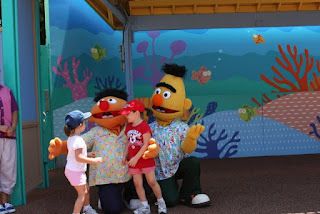 The girls initially gave Bert the cold shoulder but, they caved into the Sesame Street peer pressure. Here the girls enjoy a massive "hamster" playground. By "hamster" I mean similar to a McDonald's playground. The only thing we didn't find here was a water park. The girls were all excited because there is a nice one in San Antonio. Again, I guess because it gets so hot in Texas, they have to have something to cool everyone off! We did all of the usual shows and stuff, along with a really cute Elmo movie in 4-D that sprays water at you for effects. It was really cool! We all had a great time, and now we're all pooped and sunburned! 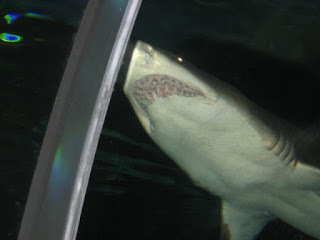 The shark exhibit was cool. 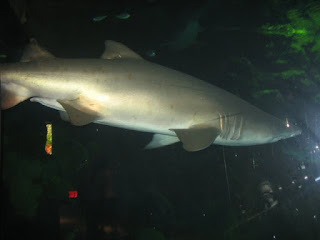 You actually walk through a glass tunnel that is in the shark tank. We're making all of these trips to amusement parks for the girls, but one of their absolute favorite things to do when we go on vacation is get to the "hotel house" and play with the phones. The first thing we have to do in any hotel is unplug the phones because they LOVE to play with them. Could be because we don't have regular phones at home so the only time they get to see them is when we travel. I'm sure the maid service thinks we're weird everywhere we go since we always unplug the phones. They also like to go straight for the complimentary pen and notepad and proceed to refine their illustration and penmanship skills. All of the drawn-on paper somehow always ends up all over the floor! 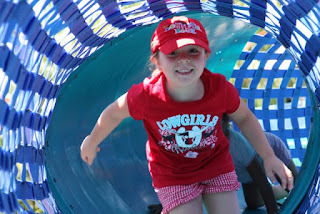 After Sea World, we dragged the girls into Trader Joe's for snacks, then headed back to the hotel. The Charles Shaw (Two buck Chuck) wine in California is still $2, unlike New Mexico where it is $3 per bottle. We ate dinner in the hotel since it's included in our stay...Ferny enjoyed the 'free' Bud Light draft beer. Then we walked around the shoreline area for a bit before going back to the room. It was so nice! The girls picked up some shells that they found and brought them back to the room to wash. They thought that was so cool. The fact that there were three paragraphs on the girls gave notices this was written by a guess blogger. Day 1 - Vacation It Is ! The first day of school for A.